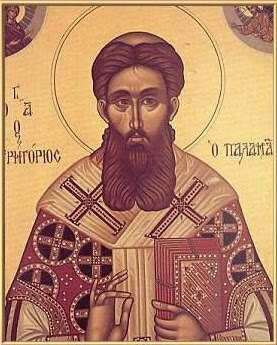 On the second Sunday of Great Lent, we celebrate the memory of St. Gregory Palamas. St. Gregory is best known for his role in the hesychastic controversy, a serious theological argument that began in the first half of the 14th century. St. Gregory was initially asked by his fellow monks on Mount Athos to defend them from charges raised by Barlaam, another monk. Barlam emphasized the unknowability of God in an extreme form, and believed that philosophers had better knowledge of God than did the prophets. He valued education and learning more than contemplative prayer, and claimed that the monks on Mount Athos were wasting their time in contemplative prayer when they should instead be studying to gain intellectual knowledge. Contrary to Barlaam, Gregory asserted that the prophets in fact had greater knowledge of God, because they had actually seen or heard God himself. Addressing the question of how it is possible for humans to have knowledge of a transcendent and unknowable God, he drew a distinction between knowing God in his essence (in Greek, ουσία) and knowing God in his energies (in Greek, ενέργειαι). He maintained the Orthodox doctrine that it remains impossible to know God in his essence (God in himself), but possible to know God in his energies (to know what God does, and who he is in relation to the creation and to man), as God reveals himself to humanity. In doing so, he made reference to the Cappadocian Fathers and other early Christian writers. Gregory further asserted that when the Apostles Peter, James and John witnessed the Transfiguration of Jesus Christ on Mount Tabor, that they were in fact seeing the uncreated light of God; and that it is possible for others to be granted to see that same uncreated light of God with the help of repentance, spiritual discipline and contemplative prayer, although not in any automatic or mechanistic fashion. He continually stressed the Biblical vision of the human person as a united whole, both body and soul. Thus, he argued that the physical side of hesychastic prayer was an integral part of the contemplative monastic way, and that the claim by some of the monks of seeing the uncreated light was indeed legitimate. Like St. Simeon the New Theologian, he also laid great stress in his spiritual teaching on the vision of the divine light. St. Gregory’s position was affirmed in a council that met 1340-1341, and reaffirmed at two further synods held in Constantinople in 1347 and 1351. Additional information about St. Gregory Palamas is available at the OrthodoxWiki and the Mystagogy Resource Center.